Notes on world archaeology, history of archaeology, heritage preservation, technology applied to archaeology, ethnology, photo-graphy and film, archaeologists, books, and museum exhibits. And, an Archive of the author's publications and reports. The problem—The biggest difficulty for historians of archaeology in any study of the Le Plongeons is distinguishing fact from fiction in writings about the Le Plongeons. Published material abounds that has not been fact checked, so it is important that references be provided. And much published secondary source material is out of date. It is suggested that authors consult the recently acquired papers of Alice Dixon Le Plongeon archived at the Getty Research Institute in Los Angeles. In that collection are also additional papers of Augustus Le Plongeon previously unavailable. The article should more fully explain the professional collaboration of Augustus and Alice Le Plongeon. Alice was responsible for the Le Plongeons’ photographic darkroom work, and was behind the camera for a good part of their photography in Yucatán. She co-directed with Augustus the excavation of the Platform of Venus, and the excavation of the Platform of the Eagles and Jaguars at Chichén Itzá. The Le Plongeons jointly developed archaeological theories about the ancient Maya, and Alice edited virtually all of Augustus’ letters and published works. The collaboration of Alice and Augustus in photography and archaeology, and their development of theories about ancient Maya civilization are brought up to date in: Yucatan through her eyes. Alice Dixon Le Plongeon, writer and expeditionary photographer (2009). Scholarly reviews of the biography provide additional perspectives and can be accessed on ArchaeoPlanet Blog (https://archaeoplanet.wordpress.com/). Alice Dixon Le Plongeon’s place in Maya studies has recently been noted by a number of scholars including emeritus professor of anthropology James R. McGoodwin at the University of Colorado, Boulder. Summary: The Wikipedia article requires a number of corrections, and needs to be brought up to date. Words in Spanish should include accent marks. Correction: Augustus Le Plongeon was an early Maya archaeologist, Americanist or Mayanist. Reference: The statement that Augustus was an “early practitioner of psychic archaeology” requires a reference. Explanation needed: The historical development and practice of “psychic archaeology” for the periods “early” to current should be summarized, as should be the archaeological methodology practiced by Augustus and Alice at Chichén Itzá and Uxmal. Reference: The statement that Alice had an “avid interest in Mesmerism… and the occult” requires a reference. Correction: Alice was a practicing Spiritualist, and attended Spiritualist séances that were popular in America and England after the mid-nineteenth century. Correction: Désiré Charnay (1828-1915) was a contemporary of the Le Plongeons and not a “later Mayanist.” He carried out photographic projects in México in the 1860s and during the time the Le Plongeons worked in Yucatán. In the 1860s during the French intervention, and after, etchings of his photographs were used to illustrate his popular books on the ancient ruins of México. Correction: Désiré Charnay was not a “Mayanist scholar” or member of the academy, and was refused an academic appointment in Paris. He was an expeditionary photographer, explorer, and writer. Explanation: In 1885, Daniel Brinton (1837-1899), professor of archaeology and linguistics at the University of Pennsylvania, wrote that the discoveries of the Le Plongeons “correct, in various instances, the hasty deductions of Charnay…” (American Antiquarian 1885:378). In his diary, Alfred Maudslay (1850-1931) wrote Désiré Charnay “does not strike me as a scientific traveler,” and “was thirsting for glory” (Ian Graham, Alfred Maudslay, 2002:102). Maudslay was equally negative concerning Charnay’s writings about the Maya. Both Brinton and Maudslay strongly disagreed with the Le Plongeons’ theory that Maya civilization was older than Egypt civilization. Correction: Scholar, photographer, and archaeologist Teobert Maler (1842-1917) was a contemporary of the Le Plongeons. He was in México in the 1870s, and again in the 1880s after the Le Plongeons departed, and carried out important site documentation, photography, and archaeological analysis published by the Peabody Museum at Harvard University. Correction: Alfred Maudslay (1850-1931) was a contemporary of the Le Plongeons and investigated the Maya city of Yaxchilán, Chiapas, México when the Le Plongeons were in Yucatán. He continued his work in the Maya area for many years after the Le Plongeons departed in 1884. Omission of Alice Dixon Le Plongeon: Alice Dixon Le Plongeon’s contribution to the theory that the ancient Maya founded Egyptian civilization has been omitted. Alice and Augustus collaborated closely in the development of that theory. Reference: The many published articles by the Le Plongeons about photography, and articles about the Le Plongeons’ photography can be quoted and referenced. Correction: The total number of Le Plongeon photographs may be as many as 700. A Le Plongeon photo album, part of the Fundación Cultural Televisa collection and titled Yucatán ilustrado. Ruinas, México, 1876, has been recently been put on exhibit. It has 101 prints made by Alice Dixon Le Plongeon and is currently under study. Background: The Le Plongeons took hundreds of stereo 3-D photographs of Maya archaeological sites, ethnographic subjects, and landscapes in Yucatán and Belize from 1873 to 1884. The Le Plongeons’ photographs were made using wet collodion glass plate negatives with a long tonal range, and the photos are the first systematic and detailed record of Chichén Itzá and Uxmal. Their architectural photos are useful to art historians, architects, and building conservators for analysis. They are also used for 3-D close-range photogrammetric analysis to generate scaled architectural drawings. Their photos of Belize may be the first taken in that ex-British colony. There are approximately 2,500 Le Plongeon photographic prints archived in public and private collections. Correction: Augustus Le Plongeon was born May 4, 1826. Correction: Augustus Le Plongeon did not graduate from l’Ecole Polytechnique in Paris, and there is no record of his attendance. Correction: Augustus married Alice Dixon in New York in 1873. Correction: Augustus learned new photographic methods from William Henry Fox Talbot in 1851. Correction and clarification: Over a period of 30 years Augustus and Alice Dixon Le Plongeon proposed a number of routes that Maya “colonists” might have taken to the Nile Valley. One route was to Southeast Asia, then through South Asia, and into the Middle East ending in the Nile Valley; a second route was across the Atlantic Ocean; a third proposed the Maya traveled from Yucatán to the continent of Atlantis and continued on to the Nile Valley; and a fourth proposed that the Maya were actually Atlantans and separate groups of Atlantan-Maya migrated from Atlantis to Yucatán and to the Nile Valley. Alice Dixon Le Plongeon put forward the latter migration route after Augustus’ death and wrote an epic poem, A Dream of Atlantis (The Word magazine 1909-11) in which she presents Maya life in Atlantis and its destruction. Correction: During the 19th century most scholars assumed that Maya civilization postdated Egypt, but there was little archaeological evidence to support that hypothesis. It was not until the 1930s that scholars were finally able to say with certainty that Maya civilization developed later than Egyptian civilization. Explanation: In the late 19th century, once the Egyptian hieroglyphic system was deciphered dating of Egyptian civilization soon followed. The first step in the development of a chronology for Maya civilization was the use of archaeological stratigraphy to determine its age relative to the other major civilizations of Mesoamerica. A relative chronology was delineated during the first decades of the 20th century. During the same period, scholars worked to decipher the Maya calendric system. By the mid-1930s the Maya calendar was understood and correlated with the Julian calendar. Scholars were then able to say with certainty that Maya civilization reached its zenith during the Common Era (CE) and postdated Egypt. After World War II, C-14 and thermal luminescence dating provided absolute dates for many additional aspects of Maya civilization. Omission of Alice Dixon Le Plongeon: Alice Dixon Le Plongeon was a major contributor to what the Le Plongeons’ believed to be an historical account of the lives of Maya Queen Móo and Prince Coh (aka Chacmool). Explanation: The Le Plongeons’ history of the Maya was one generation in depth, and was based on the iconography they found on buildings at Chichén Itzá and Uxmal. Like most archaeologists of the 19th century, the Le Plongeons had almost no knowledge of the subsurface cultural stratigraphy of Yucatán or the Nile Valley. Once the stratigraphy was excavated in the 20th century a long period of development that preceded the civilizations observed on the surface was revealed. But, lacking knowledge of a developmental sequence, the only conclusion possible for the Le Plongeons was that civilization had to have come to Yucatán and to the Nile Valley fully developed. Correction: Palenque is not located in the central Maya lowlands. Explanation: Alice and Augustus studied Frederick Catherwood’s illustrations of Maya central lowland sculpture and iconography as well as the photos and drawings of other scholars including Alfred Maudslay. They rightly argued that the style of architecture, hieroglyphs, and iconography at Yaxchilán, and other sites in that region was different from northern Yucatán. 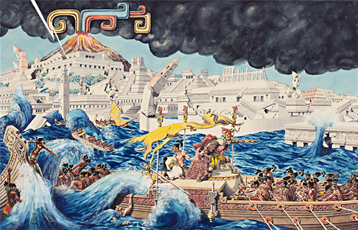 But, they were unable to accept a broader geographical range for Maya civilization that incorporated local cultural variation because their theory of Maya civilization and its diffusion to the Nile Valley excluded all art and architecture that did not conform to the art and architecture of Northern Yucatán. Published books and papers about Augustus and Alice Dixon Le Plongeon by Lawrence G. Desmond, Ph.D.
1983 Augustus Le Plongeon: Early Maya Archaeologist. Doctoral dissertation. Department of Anthropology, University of Colorado, Boulder. Ann Arbor: University Microfilms International, 3592. 1988 A Dream of Maya: Alice and Augustus Le Plongeon in Nineteenth Century Yucatán, University of New Mexico Press. Co-authored by Phyllis M. Messenger. 2005 The nineteenth century photographs of Alice Dixon Le Plongeon and Augustus Le Plongeon. A catalog of collections from: American Museum of Natural History, Donald Dixon Album, Getty Research Institute, Peabody Museum at Harvard University, Philosophical Research Society. Includes: Preface, Acknowledgements, Introduction to the Collections, 416 pages, and data entries for 1,054 images. Adobe PDF. 2009 Yucatán through her eyes. Alice Dixon Le Plongeon–writer and expeditionary photographer. Albuquerque: University of New Mexico Press. 1988 Work in Progress: Enchanted Ground. In Mesoamerica: The Journal of Middle America, Vol. 1, No. 2, P. 10, Mérida, Yucatán, México. 1989 Augustus Le Plongeon and Alice Dixon Le Plongeon: Early Photographic Documentation at Uxmal, Yucatán, México. In Mesoamerica: The Journal of Middle America, Vol. 2, No. 1, pp. 27-31, Mérida, Yucatán, México. 1989 Augustus Le Plongeon and Alice Dixon: Early Fieldwork in the Puuc Region of Yucatán, México. In, Juan Antonio Siller, Ed., Cuadernos en Arquitectura Mesoamericana, National Autonomous University of Mexico, Vol. 11, Series Arquitectura Maya No. 5, September, pp. 11-15. 1991 Registro fotogrametrico de la Pirámide del Adivino, Uxmal, Yucatán, México: Evaluación de campo, 1990. In, Lorena Mirambell S., Ed., Consejo de Arqueología Boletín, Instituto Nacional de Antropología e Historia, pp. 75-74. 1989 Of Facts and Hearsay: Bringing Augustus Le Plongeon into focus. In, Andrew L. Christenson, Ed., Tracing Archaeology’s Past, Southern Illinois University Press, pp. 139-150. 1996 Rediscovery: Exploration and Documentation. In, Jane Turner, Ed., The Dictionary of Art, Vol. 21, Part X, pp. 262-264. 1999 Augustus Le Plongeon: A fall from archaeological grace. In Alice B. Kehoe and Mary Beth Emmerichs, Eds., Assembling the Past: Studies in the Professionalization of Archaeology, University of New Mexico University Press, pp. 81-90. 2001 Chacmool. In, David Carrasco, Ed., Oxford Encyclopedia of Mesoamerican Cultures, 3 Vols., New York, Oxford University Press, Vol.1, pp. 168-169. 2001 Augustus Le Plongeon (1826-1908): Early Mayanist, archaeologist, and photographer. In, David Carrasco, Ed., Oxford Encyclopedia of Mesoamerican Cultures, 3 Vols., New York, Oxford University Press, Vol. 2, pp. 117-118. 2001 Prologue by Lawrence G. Desmond and Jaime Litvak King to Spanish translation of Alice Dixon Le Plongeon’s book Here and There in Yucatan. In, Aquí y Allá en Yucatán. translation by Stella Mastrangelo Puech. México: Mirada Viajera. 2007 A historical overview of recording architecture at the ancient Maya city of Uxmal, Yucatán (México), 1834 to 2007. In, Philippe Della Casa and Elena Mango, Eds., Panorama: Imaging ruins of the Greek and Maya worlds. Zurich: Archaeological Institute, University of Zurich, pp. 6-13. 2008 Excavation of the Platform of Venus, Chichén Itzá, Yucatán, México: The pioneering fieldwork of Alice Dixon Le Plongeon and Augustus Le Plongeon. In, Paul Schmidt Schoenberg, Edith Ortiz Díaz, Joel Santos Ramírez, Eds., Tributo a Jaime Litvak King. México: UNAM, Instituto de Investigaciones Antropológicas, pp. 155-165. I concur with Eugene’s congratulatory note, and hope that readers of Wikipedia can see past the bias and ignorance directed at Le Plongeon. My recollection is Le Plongeon contended the Mayans and Egyptians had a common origin, which may be more important than the issue of which culture preceded the other. Thank you for this review. 1. Alice Dixon and Augustus Le Plongeon, 19th century photographs of Maya archaeological sites, and the history of archaeology. 2. Ground Penetrating Radar surveys at Chichen Itza, Balankanche Cave, Kinich Kak Moo Pyramid, and Dzbilchaltun, Yucatan, Mexico. 3. Close-range Photogrammetry- A historical overview, and recording architecture at Uxmal, Chichen itza, and Labna Yucatan, Mexico. 4. Other: A book review, the Chacmool, Applied Anthropology.